For the Arab region as a whole, GDP (Purchasing Power Parity, constant 2011 prices) leveled at Int$ 6,302.6 billion in 2016, constituting 5.6% of the Word’s GDP. While GDP in Saudi Arabia reached Int$ 1,628.6 billion in 2016, the highest in the Arab region, it reached Int$ 1.1 billion in Comoros. The Gross National Income (GNI) per capita (Purchasing Power Parity, current prices) of the Arab region averaged at Int$ 16,720 in 2016, with the highest value of Int$ 83,150 registered in Kuwait, and compared to a World average of Int$ 16,170 in 2016. In terms of economic growth, the average GDP growth stagnated at around 3% between 2013 and 2016. For the GCC countries, the drop in international oil prices has weighed on their economic outlook, with real GDP growth rate declining from 4.1% (2009-2014) to 0.5% in 2017. At the regional level, fiscal deficits have generally been increasing since 2009. Except for Kuwait, all the Arab countries registered a fiscal deficit in 2017, with the highest deficit recorded in Libya at 43% of GDP. [7,8] Lower oil prices have also resulted in large fiscal deficits in the GCC countries. However, with the implementation of fiscal consolidation measures and as the as oil revenues increased in 2017, the GCC fiscal deficits narrowed to 6.3% of GDP, down from 11.9% in 2016. 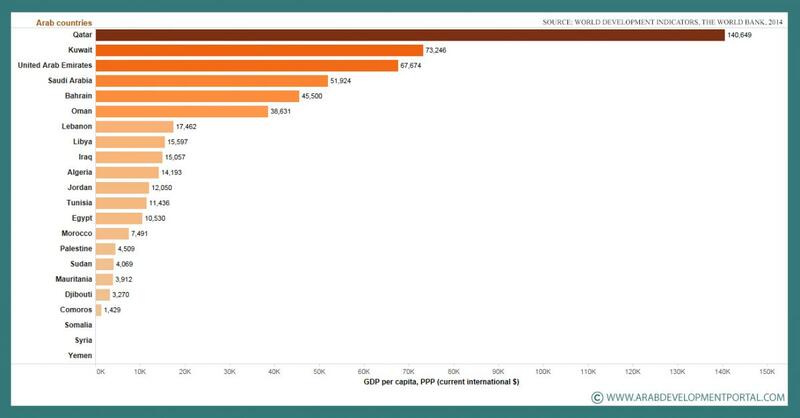 Over the same period, total government revenues, as a percentage of GDP, were the lowest in Somalia and Sudan at 3.6% and 9.8%, respectively, and the highest in Kuwait at 52.1%, while government expenditures, as a percentage of GDP, were the lowest in Sudan at 12.2% of GDP and highest in Libya at 85.4%. This overview has been drafted by the ADP team based on most available data as of 27 February 2018. Organization of the Petroleum Exporting Countries. “Monthly Oil Market Report”. Available at: http://www.opec.org/opec_web/en/publications/338.htm and accessed on February 27, 2018.